PlayerUnknown's Battlegrounds is a survival video from the creator of the Battle Royale mode of Weapon 3 and H1Z1. The game brings a complex battle system with up to 100 players can play it online, always with unexpected situations and a lot of tension. Initially you will jump from an airplane with the F key to jump from parachute. Once you land you will have to enter houses and buildings in search of weapons and supplies to equip yourself. Combat is released from the beginning, so be prepared to defend yourself as quickly as possible. Eventually the game will require you to proceed to a demarcated area on the map, a white circle. After being inside that circle it will continue to shrink and will force more and more players to move and end up being encountered in combat. 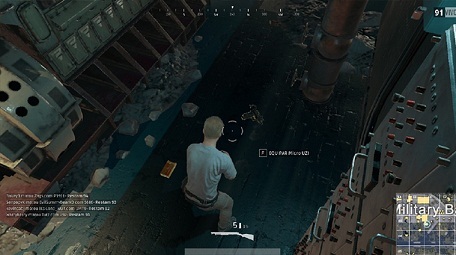 Staying outside the circle is deadly and will drain your energy very fast. The number in the upper right corner indicates how many people are still alive and their goal is to be the last survivor. The items in the game are inside houses, which appear on the map as squares, rectangles and other regular yellow shapes. Just reach the place, open the door and start searching their rooms to find weapons and supplies. White scythes, improvised weapons such as frying pans and goat's feet, light weapons such as pistols, heavy weapons such as rifles, and supporting weapons like grenades and molotovs can be found. In addition there are also first aid kits, bandages, energy drinks and analgesics. In PlayerUnknown's Battlegrounds, it is not possible to cure your character completely with only one type of item, you must have access to several. First aid kits and bandages are only able to restore your character's energy up to 75%, the other 25% can only be recovered with painkillers and energy drinks. Sound is an essential element of the game because it denounces the presence of players and their direction, so PlayerUnknown's Battlegrounds is best played with good headphones. Moving your character's head with the mouse to determine the source of a sound will become an essential skill. There are some specific sounds that players should watch out for. Sounds of shots and their intensities determine the proximity of other competitors, as well as conflicts. Footsteps mean that someone is in the same house as you. Finally the sound of a car besides indicating that there is another player nearby, also warns about risk of being hit. In the game, you’ll find some abandoned cars, which can help a lot to get around, stay inside the safe area of the game and also run over other players. Just look for the blue Dacia car, very different from the other vehicles, or a Buggy. Remember to enter by the driver's seat or you will take over one of the other seats of the vehicle. Killing the contestants is part of a survival game, but it does not mean that you should look for conflict. It is sometimes easier to stay alive by avoiding them until you have better equipment.